Hood Octagonal School (1842)- the last 8-sided one room school house in Delaware County. Located on West Chester Pike on the grounds of Dunwoody Village. 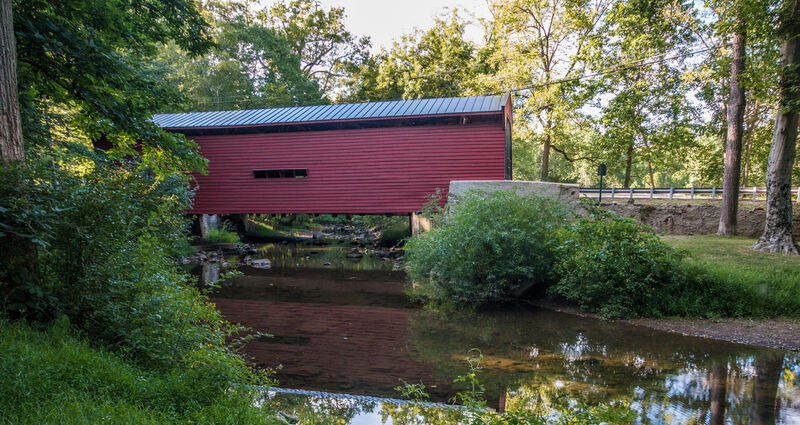 Bartram’s Covered Bridge (1860)- the last remaining covered bridge in Delaware County (spanning Crum Creek – connecting with Chester County), located at Goshen and Boot roads. Restored in 1996. Square Tavern (1742) – also known as “The Square Inn” and John West House”- the childhood site of famous American painter Benjamin West, restored in 1981 and again in 2008, located at the corner of Newtown Street (Rt. 252) and Goshen Roads. Paper Mill House (1770, 1845) – mill workers home and general store, restored in the 1980s and now used as museum and headquarters for the Newtown Square Historical Preservation Society. Located at St. David’s and Paper Mill Roads. The township is home to the Project Management Institute (PMI), a Lyondell Chemical Company Technology Center, Apple Vacations, USA 3000 Airlines, and the headquarters for SAP America, a subsidiary of SAP AG.